Contributor / Source: Suresh Kumar. 12.Write a program to print &quot;Hello World&quot; without using semicolon anywhere in the code. 21.WAP to check a string is Caliondrome or not. //Maventic question. 22.WAP to print DONE,without using any loop. // asked to my frnd in any company. 23.WAP to print DONE,without using any loop and any conditonal clause or operators. // asked to me as a cross question of 22th question by the person i asked 22th ques. 24. WAP to find out the longest word in a string. 26.WAP to print the triangle of letters in increasing order of lines..
28.Count the Total Number of 7 comming between 1 to 100. /* I made this code in a way that u can give Upper limit i.e. 100,Lower limit i.e. 1 and the specific number u wants to count in between i.e. 7 */ // asked by: VishwaPratapRana..
30. 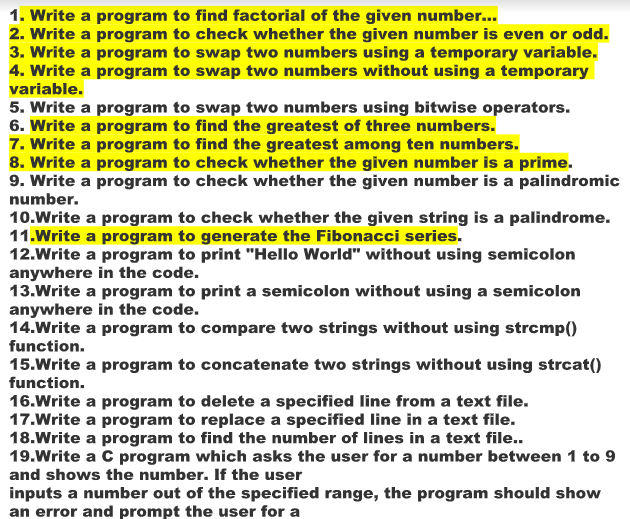 WAP to find out if a given number is a power series of 2 or not,without any loop and without using % modulo operator..// asked by someone on BJS..
* To get the file (answers, results, outputs and explanations), download the FAQ - C programs codes Questions and Answers asked in Interviews PDF.